Currently, Tito is applying for Brophy College Preparatory because he says, “they have an amazing academic program and more resources to offer,” compared to other high schools. He plans to get the most out of his experience there; his main goal being to “change school for the better.” He is definitely living up to RBBB’s core values: Be Excellent and Be Kind! 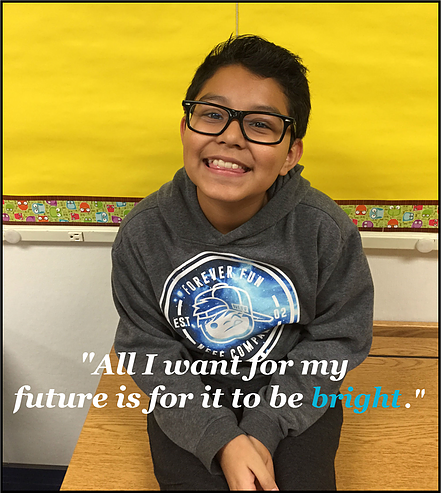 His experience as an RBBB Reading Leader has lead him to want to teach “anybody anything as a teacher or volunteer someday.” Tito has hopes of getting into college to accomplish his dream of becoming an attorney. He aspires to become financially secure and independent saying, “I want to have my own; my own money, everything.” We welcome Tito to come back and help us in the future; he’d make an amazing site leader!